Jason Clay Lewis was born in Enid, Oklahoma surrounded by fast cars and open sky. In his formative years, drag racing and other high adrenaline pursuits were the family's first mode of entertainment. This fueled his interest in anything that went fast and pushed the limits. With an intense passion for drawing and wanting to see the world, recognition at Oklahoma State University led to a scholarship and apprenticeship with Master Printer Bill Goldston at Universal Limited Art Editions in New York. On his very first day he met Jasper Johns who had come to work on a new print edition. While at U.L.A.E., he worked along side artists Jasper Johns, Robert Rauschenberg, Jim Rosenquist, Carroll Dunham, Jane Hammond, Elizabeth Murray, Kiki Smith, and Terry Winters. This led to becoming Jasper Johns' personal studio assistant where he was immersed in the everyday activities of the studio as well as handling the daily life of the artist. This gave Lewis the extraordinary opportunity of meeting individuals such as Leo Castelli (art dealer), Michael Crighton (writer), John Cage (composer), and Merce Cunningham (choreographer). Through these interactions, Lewis gained an immense appreciation of the ethics, inner workings, and incredible dedication it takes to succeed in the art world. Continuing his education at The Cooper Union, Lewis studied with artist Hans Haacke and graduated with a Bachelor of Fine Arts. The Royal Society of American Art in Brooklyn, New York was created in 2013 due to his unwavering interest in building a community. Lewis is the Director of The Royal (gallery) at RSOAA where his responsibilities include curating and promotion of all gallery exhibitions as well as the day-to-day running of the studios. His years of experience as an art professional working in and around the New York art scene has allowed him to show extensively both in the United States and internationally. International exhibition locations of note include Prague, Czech Republic, Imperial Belvedere Palace Museum, Vienna, Austria and his most recent exhibition in Beijing, China June 2016. The Knife Cuts are a culmination of Lewis' unrelenting pursuit in creating his own visual language. The psychological significance that comes with the knife has become the foundation Lewis uses to create his signature style. All of the straight lines in the paintings and drawings explore the relationship between the knife as a tool and the mark it makes. 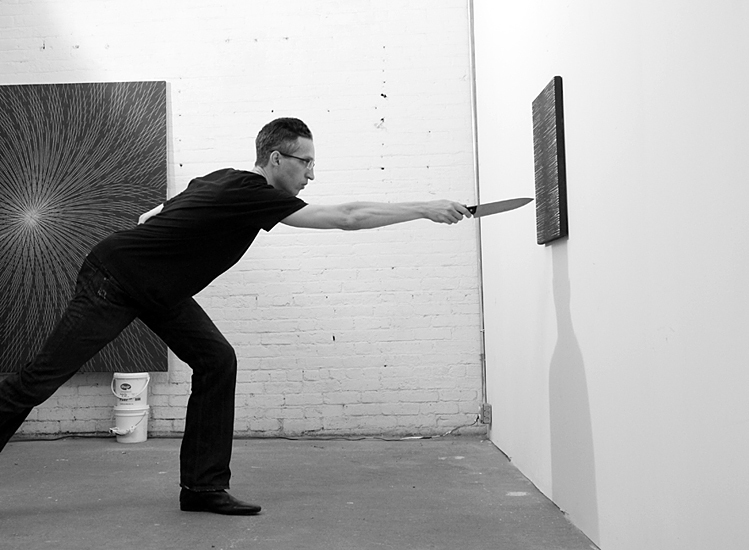 The use of the knife is significant because it gives the work a dangerous quality and a larger metaphorical context. Falling somewhere between calm and violence, there is a delicate balance between raw power and finesse. By repeating the cuts over and over again, Lewis creates dense multilayered surfaces rich with networks of lines and spikes that radiate a powerful luminosity. The knife cut works walk this line between action and intent. The complexity of the work stresses not only the cosmopolitan nature of art, but the volatile machinations of humanity. "As an artist, my approach has always been intentionally to confound and challenge attempts to make things fit into what we already know and think. I strive to question perceived beauty, life, and creation. I have an urgent conviction that art is a passionate and essential affair, as if a matter of life and death, where one senses the only response to our mortality is art. Without glossing over the violence of the natural world I ask questions about man's suicidal folly, the one we call progress, a merger into commerce and profit, of false facades that force us to reconsider our world of visual imagery. I tinker with these visual explanations, trying to give them purpose, direction, and meaning, always perfectly aware that knowing this constant probing does not have a sequence to a perfect solution. Atypical and fascinating, as an adventurer blending expression, analysis, and experience, I use every means and media available to explore my love of knowledge and depict limits, while trying to push those limits even farther. My interest in unique tools and materials helps to develop my ideas of attraction verses repulsion allowing my work to have both a strong visceral feeling while maintaining a direct cerebral presence." Jason currently lives and works in Brooklyn, New York.